It seems like the cats from Alaska are dominating the headlines this week. 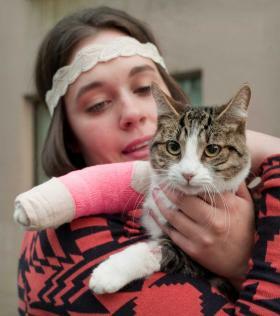 A 2-year-old cat, named Wasabi was chasing a mosquito in her owners' apartment in Juneau. The mosquito escaped out of the open window and so did Wasabi. Wasabi landed in a parking lot. Her owner, Stephanie Gustafson, ran down and found Wasabi bloody and soaked from the rain. Poor Wasabi had fractured her radius and broke some bones in her elbow. An operation was needed to help her.